My father is a big cult film geek. If you give him the names of films that have been made within the past 40 years, he’s more than likely seen them. In some way, he is my inspiration to become a film-maker, not only cause of the knowledge he has about the industry but because of his own small career in film-making thirty years ago – (I have personally seen some of them). ‘Soylent Green’ was one of the first films we both sat down as father and son and watched together. He said at the time that it’d somewhat change my life. And in retrospect, it has. He’d even put my sister through it too (in a separate viewing) about what, 5 years previously. There’s even a humorous story within my family’s history about my father and my grandmother watching this movie in a multiplex and the carousel’s being in the wrong order so none of the storyline actually made sense. To be straight with you, ’Soylent Green’ is definitely not a Hollywood blockbuster, nor a high budget movie either. It’s more a B-class movie. In my view, the film’s own outlook of the world in such a morbid and futuristic fashion (through it’s remarkably low budget) is the most effective type of science-fiction I’ve seen to date. It’s not really a film that comes with the usual traits of a science fiction masterpiece, say, ‘Alien’ (1979) either. No spaceships, or aliens, just pure human expression within the boundaries of theory and fantasy. But really why is ‘Soylent Green’ effective? It’s because of this: it carries a strong horrific message throughout about the long term effects of overpopulation and pollution which slowly but surely is coming true even now. It’s that GOOD, and dare I say, a complete mind-melter from beginning to end. SO what is the plotline to ‘Soylent Green’? Well, in 2022, at least a decade from now, Thorn (Charlton Heston) is a New York detective, who is investigating the murder of a businessman who works for the Soylent corporation who makes processed food crackers in different colours. As he investigates, Thorn becomes a target himself and discovers a major conspiracy. Sol Roth (Edward G. Robinson) is Thorn’s paternal-ish father figure who helps out at home as a information expert and digs for clues. How does ‘Soylent Green’ see as the future? Women as furniture, the poor being fed food crackers as nourishment instead of raw meat, limited amounts of soap and paper, a huge green smog over every city, removal bins being used as scoops for dead bodies, and crowded homes full of unemployed people…it’s no ‘Blade Runner’ (1982) at all, but the film’s shocking ideas about the future are just as deadly. In my opinion, ‘Soylent Green’ is a lesser known film within Heston’s career, and it‘s a shame really cause it‘s a bloody good film. His acting is top notch, especially with his co-star, Edward G. Robinson (who sadly died 9 days after filming finished – meaning ‘Soylent Green‘ was his last film), Heston’s own passion as an actor makes poignant scenes such as the ‘Sol Going Home’ segment seem more memorable and especially emotive. Each character plays a significant part to the overall storyline. Even the ending is worth the one and a half hours screen time, and sticks in your mind as the credits roll. To ridicule a film like this is to say that the last thirty years of the movie industry were a complete mistake. 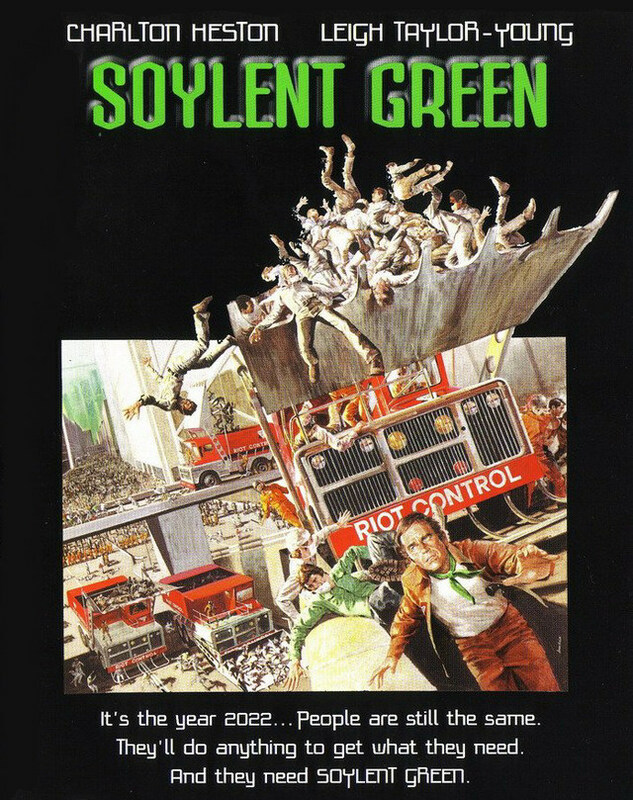 My father thinks that ’Soylent Green’ shouldn’t be re-made for the new generation, as it would ruin it completely, but I personally believe it’s a film that HAS to be re-made before it’s too late, and I would gladly write and direct it if someone put the finances up. In conclusion, ‘Soylent Green’ is a film that EVERY school (in both the US and UK) should have as a general viewing in some module on their curriculum. Not only is it a weird and forgotten science-fiction movie, it‘s somewhat educational too. It’s a thoroughly enjoyable and groundbreaking film for it’s time, and worth a watch if you ever see it on TV or DVD.